Welcome to the February issue of the MACAW Flyer. It's times like this, when the temperatures are 10 below and the wind chills are 30 below, I can't help but envy those birds that fly south for the winter. It's a bird's life! I want to thank everyone who attended our last meeting on January 12th. For those of you who couldn't make it, we had great program lined up. The meeting opened with soft Enya music playing to a brief slide show of a past MACAW Bird Fair, followed by two pages of club announcements, then our interesting guest speaker Bobbie Webster talked about her organizations work trying to save the Great Green MACAW in Costa Rica. Our meeting ended with two free lottery ticket drawings. Congratulations to the winners Jan Hickey and Kathy Thimling! After the drawing we invited everyone to stay and join in the fun and socializing while making bird toys. It was a good start to a new year for MACAW, with over 25 people in attendance. If you would like to learn more about the efforts to save the Great Green MACAW, here is the link to their web site, http://www.greatgreenmacaw.org (also listed on our web site). If you would like to read about all of those announcements, please visit our web site at http://macaw.axisdata.com/. You may be surprised to see all the information that is available to you on our web site. Our MACAW Flyer is there, upcoming events, forums including announcements, birds for adoption, news and our library to name a few. Another web site MACAW has is at www.madison.com/communities/macaw. Here we reach out to the community and get free listings in the Wisconsin State Journal listing our clubs upcoming events. Both web sites are there to help keep you informed and offer you opportunities to communicate with other members between meetings, it's worth a look. We have a lot of exciting upcoming events planned for you. This month we have on February 9th, Professor Stanley Temple from UW Madison, Department of Wildlife Ecology. Dr. Temple will discuss captive breeding and reintroduction programs and how he is working to conserve endangered bird species. It sounds like another great program being lined up. We will also have a little surprise, like we did at our last meeting, my Wisconsin Lottery Scratch Off Ticket Giveaway where a ticket will be given to one lucky attendee, and opportunities to socialize, make new friends, share information and knowledge and back by popular demand, bird toy making! So mark February 9th on your calendar and come out and visit your friends at MACAW, learn something new, have some fun and maybe even win a $1 WI lottery ticket. Please also mark your calendars for our biggest event, the 2003 Bird Seminar, May 3rd, from 12-6pm at the Humane Society. Details of all these upcoming events are listed here in this flyer and on our web page. Another exciting event will be an article written about our club in the Capital Times. You'll want to check our forums announcements or subscribe to the MACAW Insider email (send email to stevenf@charter.net) to get up to the minute information on this. We expect sometime between now and the next flyer that this article will appear in the newspaper. Did you know that in April, MACAW will celebrate its 20th birthday? How should we celebrate this grand event? Should we have a birthday party in April, with cake and presents? What would you like to do in celebration? Thank you for being with us today. I now invite you to read through our February issue. There's a lot in this flyer, including a new free bird cage cleaning service, events at MADCAT, Adopt a Highway update, birds for adoption, upcoming events and much more. Also, please don't forget the 10% discount MADCAT Pet Supplies offers every member on all bird supply purchases. MADCAT is at 7820 Mineral Point Rd. Please refer to our January flyer or our web site if you need more information. Thanks again, hope to see you February 9th! By breeding exotic birds in captivity, then reintroducing them to the wild, scientists hope to conserve the dwindling numbers of species. One of these scientists, Professor Stanley Temple of the UW-Madison, will be on hand at the February meeting to tell us about his own captive breeding and reintroduction research experiences -- how he is helping to conserve endangered bird species, including the Peregrine Falcon and the Trumpeter Swan. Dr. Temple is a professor in the Department of Wildlife Ecology, where he teaches environmental courses and performs conservation-related research with the help of his students. He is also an active member of the conservation community, and has experience working in some notable institutions, including the Cornell Laboratory of Ornithology, World Wildlife Fund and the Cleveland Museum of Natural History. 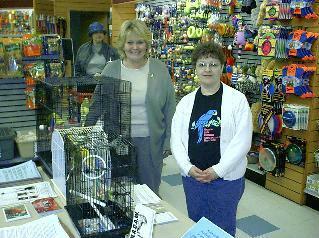 Kathy Thimling and Sandi Meinholz staffed a table at MADCAT Pet Supplies on Saturday, January 18. Many of the store's customers stopped by to pick up literature, chat and ask advice about their pet birds. Some items (bird food and paper towels) were donated for Fine Feathered Friends. Although 2 budgies were adopted, 4 cockatiels were surrendered at our table (one Mom plus 3 babies). Fine Feathered Friends avian rescue and sanctuary will ensure that the babies are completely weaned and offer them and the mom for adoption when they are tame and socialized. Many, many thanks to Joe Kazda and Ted O'Donnell of MADCAT Pet Supplies for allowing MACAW the space in their store for a table, and for keeping a donation barrel for Fine Feathered Friends! Remember.... if you mention that you are a member of MACAW when you check out, Joe and Ted will give you a 10% discount on all bird food and supplies you purchase at MADCAT. Thanks, Joe and Ted! Are you short on time, or short on energy? Do you need help cleaning your bird cages? Sandi with Fine Feathered Friends Bird Sanctuary has started a new bird cage cleaning service in the Madison area for people who need help cleaning their bird cages or who don't have enough time to do the job themselves. She will do a MAJOR cage cleaning, and is offering MACAW members this service for free, however donations to her bird sanctuary and rescue would be greatly appreciated. As you may already know, it is recommended that our bird cages be cleaned daily, but it may be hard for some people to do this for health reasons or simply no time. Sandi owns her own professional cleaning service where she cleans homes and offices, and has decided to expand into this new area out of a need that some people have expressed to her. If you would like to schedule an appointment, or ask Sandi for more information, please contact her at smeinie@charter.net or call 274-2615. Proceeds from this new bird cage cleaning service help support The Fine Feathered Friends Bird Sanctuary. To learn more about The Fine Feathered Friends Bird Sanctuary, please visit their web site at http://www.madison.com or at their main web site at http://www.feathered-friends.com/. Bobbie Webster of the Stevens Point Chapter of Friends of the Great Green Macaw came to Madison to tell us what this organization is doing and how they are helping Macaws in the wild. The organization was founded in 2000. It owns property in Costa Rica, which is the location of the sanctuary. The mission is to protect, preserve and rehabilitate the Great Green Macaw in its habitat and also other species (flora and fauna) that are native to that habitat. The Great Green Macaw is also known as the Buffon's Macaw. It is the second largest bird in the parrot family and also the second largest Macaw. Scarlet Macaws are also sometimes found within the same habitat. Radio collars have been used on Great Green Macaws within the sanctuary, and this use led to the first scientifically discovered nest site, which happens to be on the property. Fewer than 35 breeding pairs are known in all of Costa Rica. The native range of this species is shrinking and small populations are becoming isolated due to deforestation. The birds are cavity-nesters, and their habitat is lowland tropical rainforest. They nest in Mountain Almond trees, the nuts and other vegetation of which also supply 80% of the Great Green Macaws' diet. This tree is a super-canopy tree, one that is taller than most of the surrounding rainforest canopy. Great Green Macaws soar between Mountain Almond trees, above the canopy, so they are seldom seen near the ground. These trees also have cavities which collect water that the Great Green Macaws drink. The Macaws also drink water trapped in bromeliad plants. These live off the moisture and nutrients they gather from the air. Bromeliads don't have penetrating roots. The wood of Mountain Almond trees is prized by Costa Ricans because it is very hard. A fallen trunk will not rot in 25 years, even in the rainforest. The wood is used in Costa Rica for truck beds, flooring, patios, decks, etc. Friends of the Great Green Macaw has a motto: Protecting the Great Green Macaw to Protect Diversity. By protecting the Macaw's habitat other species such as jaguar, tapir, poison dart frog, keel-billed motmots (another species of bird), and other animals that live within the sanctuary are also protected. Friends of the Great Green Macaw have three designated plots on which they regularly survey bird populations of all species. Six new species have recently been identified on the property. The Friends of the Great Green Macaw is also working on reforesting areas of their property that were previously cleared wetlands. Interns from schools and organizations come to the sanctuary to study and assist Friends of the Great Green Macaw with things like fence building to keep cattle out. Friends of the Great Green Macaw also plant vegetable gardens to feed themselves in an attempt to become self-sustaining and make a little money for other needed items. They also use their modest garden to educate against the meat economy that is contributing to rainforest deforestation. Friends of the Great Green Macaw is also looking into conducting eco-tourism. Three different types of forest (dry, cloud, and rain) exist in Costa Rica, so the organization is seeking to build a wildlife trail. Their presence helps to discover and limit illegal logging. At the end of Bobbie's presentation, Lisa Wetterlin, an intern from the sanctuary spoke. She spent two months there, where she planted trees, transplanted other trees, gathered seeds from Mountain Almond trees and began germinating them. She assisted with the gardening. The facility on the property has no electricity, but running water is a welcome recent addition to human comfort there. She added that Great Green Macaws are almost always seen in pairs, and they mate for life. They fly so high above the canopy that it is hard to tell how very large they really are, and Lisa was astonished at how loud Great Green Macaw calls are. Thanks to Friends of the Great Green Macaw for an interesting and informative presentation. As of this writing, the shelter has four doves. Please contact Jane Hanson with questions about bird adoptions at 608-838-0413, extension 101. You can also contact Pam McCloud-Smith (the shelter's executive director and MACAW's treasurer) at extension 111. Fine Feathered Friends Sanctuary has 6 young male parakeets of various colors and 2 young females available for adoption. They also have 3 very young cockatiels, just weaned. These are pied to normal cockatiels and we are not sure of their gender as yet. For more information call 274-2615 or email smeinie@charter.net. Pictures can be seen at our website: www.feathered-friends.com . I'm happy to announce that we have met the requirements to start our Adopt a Highway program! Please look for our new sign to be posted somewhere between Whitney Way and Gammon Road, stating that the Madison Area Cagebird Assoc of WI has adopted this stretch of highway and to help keep it clean. Many thanks to our members who have volunteered to make this possible. These members are Clarence Cameron, Jackie Hugo, Bob Lockhart, Randy and Sandi Meinholz, Paula Fitzsimmons and myself. Thanks again! Our duties will start sometime in the spring at which time I will call you. If anyone else would like to help us keep this section of our highway clean, get a little exercise, maybe see a bird or two, help the community and our club, please send me an email or see me at one of our meetings. The MACAW Flyer is now available to you to read on our web site at http://macaw.axisdata.com/flyer.htm . In an effort to save needed funds, we would like to ask that everyone read our newsletters there instead of mailing them out to you every month. We will still mail the flyer out to you if you request it. If too many people make this request however, we will have to think of increasing our membership dues to offset these costs. Our club hasn't raised fees in 20 years, and in that time every cost imaginable has went up numerous times. Membership in MACAW has been a great bargain for $15, and we want to continue to give you this bargain and more value in your club membership. If you have any questions or concerns regarding this matter, please feel free to email me at stevenf@charter.net or see me at one of our meetings. Stop by our MACAW table and say hello to Kathy and other members staffing the table! 38 toys were made by a creative handful of volunteers after the January meeting. Members stayed for about an hour after the meeting to make the toys for Fine Feathered Friends avian rescue and sanctuary. Supplies donated by MACAW. Many loud and grateful squawks to those who stayed to help! April 13th - Externship recipients Allison Shreve and Maria Verbrugge, students at the UW-Madison Veterinary Medical School. Topic: Egg Binding. May 3rd (Sat.) - Our seminar, at DCHS. Allie – African Ringneck; @ 10 years old; not tame – cage pet; Adoption Fee $75. Harley – African Ringneck; @ 2 years old; not tame but could be with some work; was tame at one time; Adoption Fee $100. In foster home. Mooley – Orange-Winged Amazon; adult; prefers women; talks; is tame for some people; loves to sit on top of his cage; Adoption Fee $300. Budgies – We have over 20 budgies available – cage pets, not tame – adoption fee $8 each – sale on green/yellow – 2/$10 or $6 each. Megan - Budgie; @3 years old; at least ½ English; turquoise; cage pet; Adoption Fee $15. Lucky – Cockatiel; adult; tame; has smaller eyes (genetic); Adoption Fee $40. Mr. Too – Umbrella Cockatoo; male; ex-breeder; not tame-slightly plucked; needs pet home where he will be allowed to just be himself and not pushed to be a pet. He is not at the Rescue but we’re helping to find him a good home. Adoption Fee negotiable. Call or Email for more information. In private home right now. Cigi – Blue-Crowned Conure; @ 20 years old; tame; needs quiet home; prefer adults – needs lots of outside the cage time; Adoption Fee $100. JJ – Blue-Crowned Conure; @ 8 years old; tame; slightly plucked but feathers are coming back; vet checked; very nice bird – just wants to be on your shoulder; Adoption Fee $100. Mickey – Blue-Crowned Conure; adult; owner died; is finger tame; needs lots of human interaction and away from cage time; talks; Adoption Fee $100. In foster home. Ozzie – Blue-Crowned Conure; @ 20 years old; tame; talks a little; adoption fee $150 – very nice bird – just wants to be with you. Scooter – Blue-Crowned Conure; adult; tame; makes lots of sounds; prefer at home older person as she needs lots of attention and is used to older people; Adoption Fee $150. Scooter is now in a foster home. R.D. – Nanday Conure; adult; needs work; semi-tame – will step up on hand; social with other birds; likes to be out of his cage; Adoption Fee $75. In foster home. Norma - Patagonian Conure; @ 3 years old; tame; very loving here at the Rescue; Adoption Fee $300. Callie – Peach-Fronted Conure; @2 years old; tame; talks a little bit; prefers quiet home; needs lots of handling to keep tame. Adoption Fee $175. Kellie – White-Eyed Conure; adult; bonds strongly to one person; needs work; experienced bird owner only; Adoption Fee Negotiable. Whisper & Stormy - we have two older Ringneck Doves available for adoption. Adoption Fee $15/pair - need to go together. Honey – Quaker Parakeet; @ 1 year old; very tame away from cage but cage aggressive; talks; Adoption Fee $100; no other pet birds (unless caged such as finches); no young children. Roxy – Quaker Parakeet; @ 7 months old; hand able and tame but doesn’t quite yet know how to step up; vet checked; Adoption Fee $250. The Pet Network is open to the public Saturdays/Sundays from noon to 5 p.m. and Thursdays from 1 to 6 p.m. Please renew your membership with a $15 check to MACAW. Mail to MACAW, c/o Sue Brunsell, Membership Director, 2240 Keyes Ave., Madison, WI 53711.